100% Viscose from Bamboo Coming home from a restful vacation can be difficult, especially when you have to leave all that endless bliss behind. Now you don’t have to. With these resort bamboo sheets, you’ll have the comfort and quality of a beach resort in your own home. 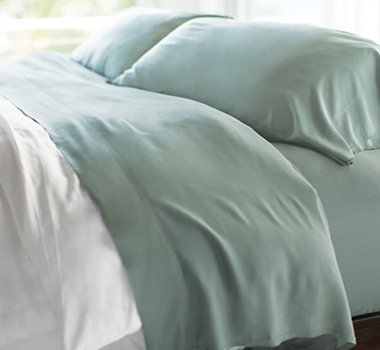 Featuring a sleek sateen finish with advanced box-stitch seams, these sheets are perfect for softness and durability. Each set includes 1 flat sheet, 1 fitted sheet, and 2 pillowcases, while our split king set has 2 fitted sheets. Fitting mattresses up to 18” deep. Wash in cold and tumble dry on low heat. Also, at no risk to you, you’ll get free shipping and a lifetime quality guarantee. King - 78" x 80"
Cal King - 72"x 84"
Standard Size Pillowcase - 20" x 30"
King Size Pillowcases - 20" x 36"